It was nice to get some good food in El Calafate, but after seeing the glacier, there wasn’t really much more I wanted to do. I took a day for some rest and recuperation and then set off for the Chilean boarder. I was travelling lighter now as the OEM xCountry rack had snapped in two places, so I ended up throwing it and the Touratech plate away. My roll bag was now my pillion, and the 10 litre fuel tank I’d bought from a Copec in Chile, was riding on the right pillion peg. The setup seemed to work brilliantly. Setting off from El Calafate I enjoyed miles and miles of asphalt. I was told that it was all sealed roads to the border but it didn’t quite work out that way for me. Partway into the journey I saw three Italians on Honda 650 Dominators. Just as I over took them I had to turn right onto a gravel track. They continued along the tar. The track was poorly maintained, in fact I think it might have been a road under construction. Either way, it was bad in places, and continued for some 30 miles. At the roughest part of the track I found a couple on a Honda Transalp. The girl riding pillion wasn’t impressed with the road. The guy had stopped for a cigarette break and presumably a telling off too. Once that was over with I hit another 10 miles of tar before being instructed to turn off again. I thought this can’t be it surely. I was on a beautifully smooth, wide tarmac road just 5 miles from the boarder buy the GPS was telling me to turn down another gravel road. Well, It was right. I took the turn, and low and behold, came up to the boarder. The South Americans really do have a knack for building border posts in the middle of nowhere. To my surprise this border crossing came complete with an hour long queue. After about 40 minutes queuing up with the Patagonian sun beating down on me through the hole in the ozone layer, the three Italians turned up. 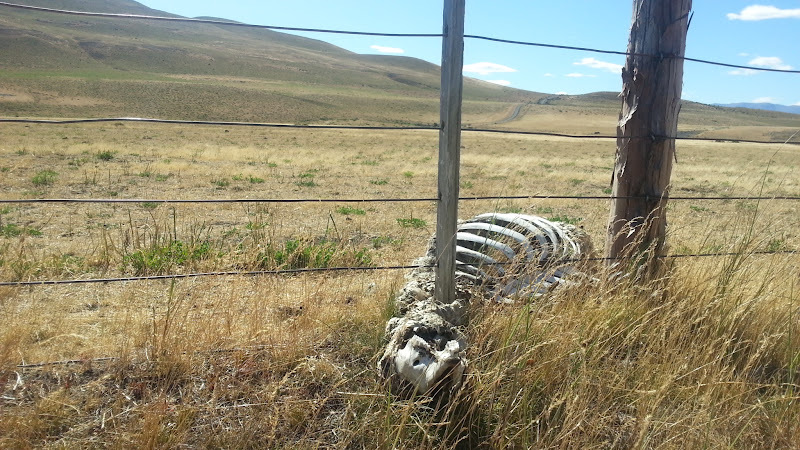 Apart from the very last stretch, they’d found an all paved route from El Calafate to the border. Shame it took them so long, as by the time they arrived the queue was even larger. Despite the huge queues on the Argentinian side, customs in Chile was empty. As such I breezed through it in just a few minutes. Next to the customs building, there’s a cafe/shop that also has a Bureau de Change. Don’t change any money, it’s a complete rip-off. Once through customs I was into the Chilean countryside. I later stopped for a comfort break and came across a familiar sight in this region. Animals tend to get trapped in fences and eventually die. It’s an unforgiving land. A short while later I reached the Torres del Paine park entrance. The entrance here was staffed by two Chilean women, both spoke excellent English. The cost to enter the part was around £20 but the ticket was valid for multiple days/entries. A shame then that I would only be spending the night, and not get to make the most of this wonderful location. From there on it was gravel all the way. Again this was non-technical so I was able to fly along at highway speeds for the most part and have fun power sliding the rear around the bends. for me this is what adventure riding is all about. A lot of people on AdvRider forums go on and on about single track. Particularly North Americans. I’m more interested in rally raid style events and landscapes, wilderness, and isolation. The stuff you see in the Dakar, and other rallies the Hellas, Lybia, Albania etc… Sure I could have fun and play in the forrest all day, but the wide open, rugged, inhospitable land, that’s adventure riding to me. I whizzed passed an old RD07 Africa Twin and one of the big 1200GS BMWs on the way to my campsite, Camping Lago Pehoe. They looked to be taking it relatively easy, I was enjoying myself too much to slow down. 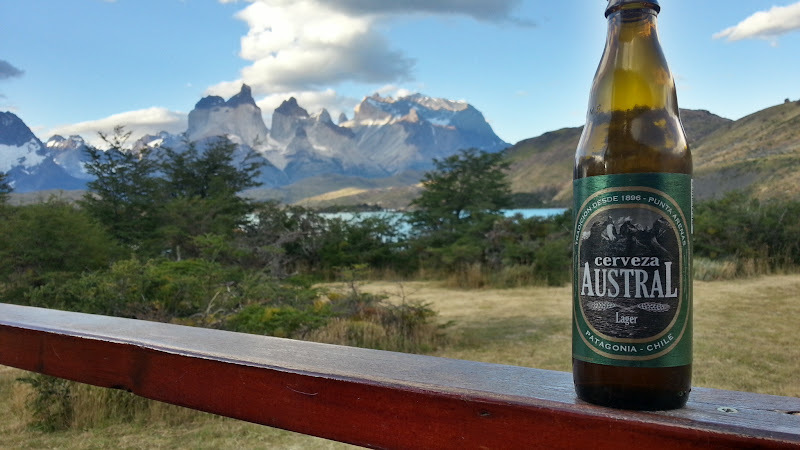 During my time in Chile I’d been drinking a lot of Austral beer. In particular the larger. There was a reason I stayed at this campsite. See if you can figure it out. Tip, look closely at the label. And here was the view from the campsite. Shortly after I’d set up my tent, the Africa Twin and BMW turned up. 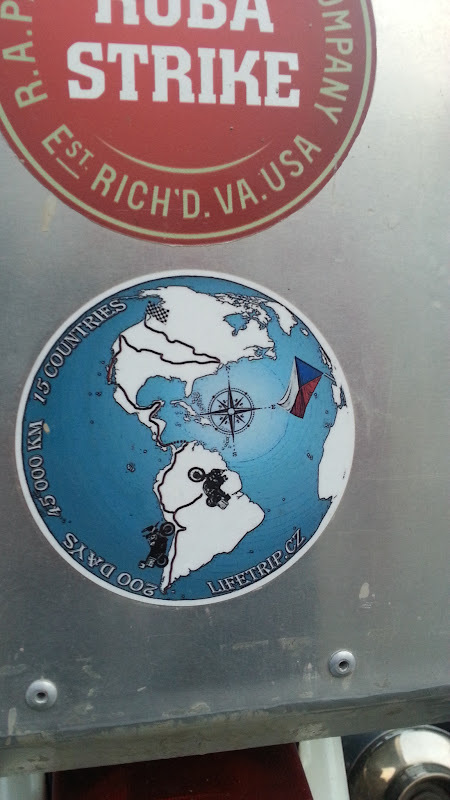 It was a couple of Czech guys who’d ridden down from Valparaiso, and planned to ride up to Canada. We talked over dinner and a beer. They said that they’d stay in the park a second night and take some photographs and video for their blog, unfortunately I wasn’t able to join them as I needed to be in Puerto Natales the next day. It was a short ride to Puerto Natales the next morning. After a great pizza dinner, and meeting some fellow travellers, I spotted the Czech guys struggling to get their large machines into the tiny garage of a local hostel. It turns out that guy on the BMW ran out of talent on a corner in Torres del Paine and went down on his hard cases. This of course ripped the right one off and broke his pannier rails. An advert for soft bags? After looking over the Africa Twin I was thinking it was perfect bike for South America. Big enough to handle the massive distances between towns, good fuel range (though poor economy), and although heavy still capable in the dirt. Add to that the great Honda dealer network in this part of the world. My thoughts changed when the rider told me that he’d just spent the last four hours in a machine shop getting the bike fixed. 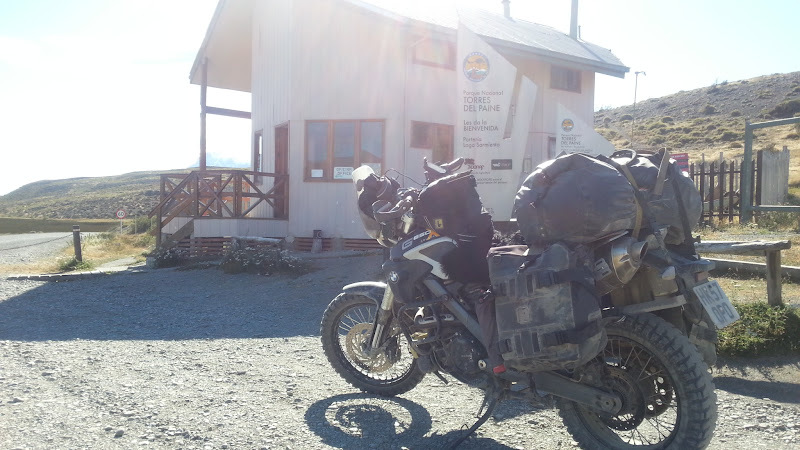 The vibrations on the gravel roads in Torres del Paine had cracked his fairing stay, and the fairing was flailing around. The thing is, compared to what I’d previously been doing on the xCountry, that road was a piece of cake. These guys still had the Austral to come, let alone Bolivia and Peru. Should be interesting. Their website details are in the picture below.